Part of the lore of fly fishing in Pennsylvania, and the Cumberland Valley in particular, revolves around stories of big fish, usually giant brown trout. Of course this comes as no surprise to fishermen, nevertheless stories of great fish, caught and got away, serve to set the stage for what might happen every time we visit Letort or some other famous stream. Among these famous fish stories, perhaps the best known is the story of “Old George” as recounted by famed Cumberland Valley fly fisher and fly tying innovator Ed Shenk (think “Letort Cricket” and other patterns). 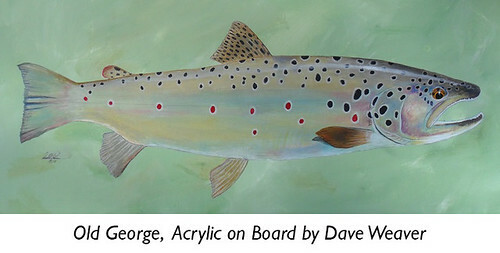 “Old George” was the name Ed gave to a very large trout he pursued for over a year in the upper Letort in the early 1960s. The fish dwarfed other browns in the same pool that were themselves over twenty inches. Ed carefully observed this particular fish and patterned its daily comings and goings (not surprisingly, Old George came out in the evening and returned to cover early in the morning) and described the great fish as being very light colored. He saw, hooked, and lost the fish multiple times. 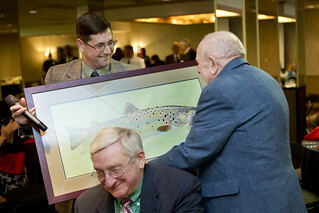 Finally, he caught the brown on a streamer fly in 1964. Old George taped just over 27 inches and weighed eight pounds. In a final twist in the story, Old George turned out to be a female. The story of Old George went on to become part of the lore of Pennsylvania fly fishing. Ed recounts the full story of Old George in the final chapter of his book Fly Rod Trouting. On occasion, I’ll paint portraits of specific fish caught by anglers and using an old faded color photo and Ed’s description of the fish, it was my pleasure to paint a life sized image of Old George. This painting was presented recently as a gift to Ed at the 2015 Limestoner banquet held by Cumberland Valley Trout Unlimited. Ed was the guest of honor at this year’s banquet. It was a privilege to see Ed Shenk reconnect with Old George after the passing of half a century.